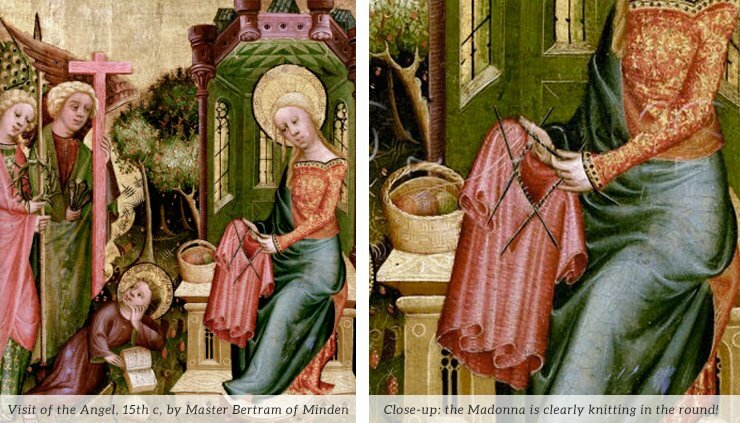 The History of Knitting Pt 2: Madonnas, Stockings and Guilds, Oh My! In Part 1 of “The History of Knitting,” you learned that knitting most likely began in Egypt at around 1000 AD. From Egypt, knitting spread into Spain – carried over by Arabs during the Islamic Conquest or brought back by Spaniards during the Crusades – before exploding into the rest of Europe. 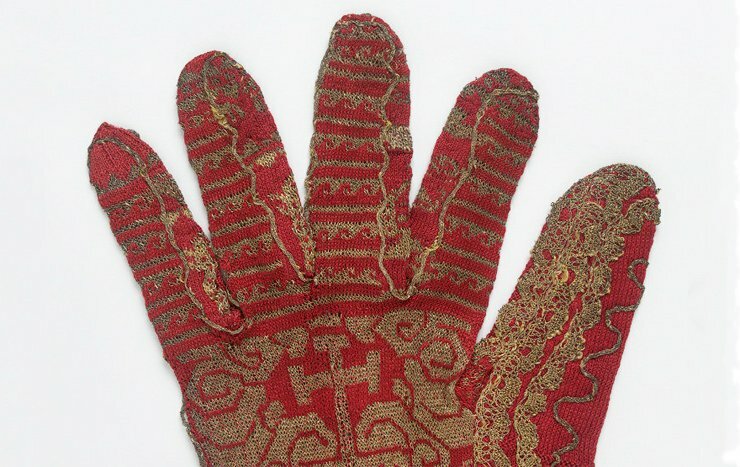 What we know about early European knitting is that it was mostly confined to the very rich, very royal or very religious (as in the Catholic Church). Case in point: the first pieces of European knitting were found in the tomb of Prince Fernando de la Cerdo of Spain. 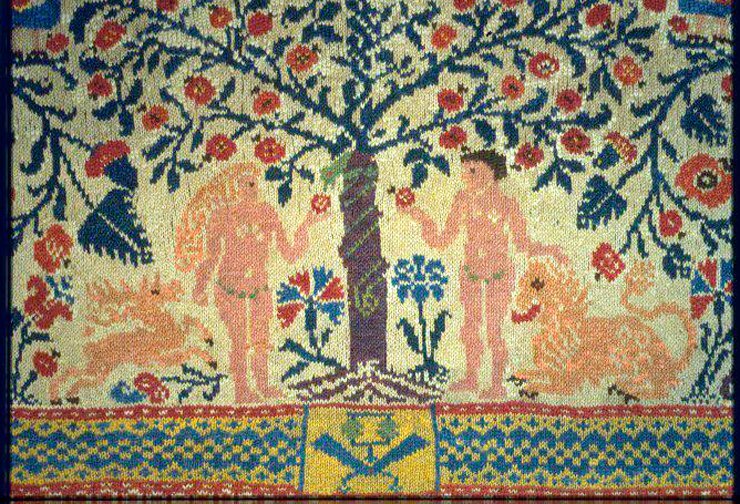 They are detailed silk pillow covers that date to around 1275 AD. In Spain, early knitting mostly consisted of liturgical garments and accessories for the Catholic Church. Made with very fine yarn, they were sometimes stitched with gold and silver threads. 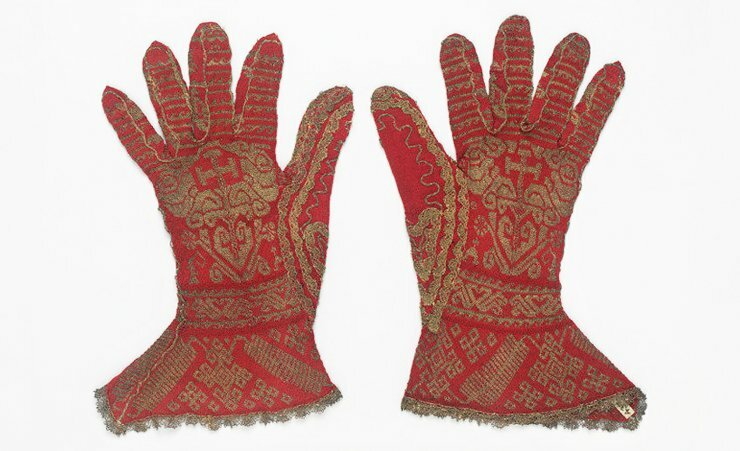 Early knitted Spanish gloves made with red and yellow silk, worn by a bishop, 16th century. Victoria & Albert Museum. These gloves have a gauge of 23 sts/20 rows per inch! Can you imagine? ca. 16th century. Victoria & Albert Museum. In other parts of Europe, knits were small and dainty – things like relic purses for holding the remains of saints, pillows, stockings, purses, and pouches. These were more decorative accessories than practical workhorse garments. Then, around the middle of the 14th century, a funny thing happened. In Italy and Germany paintings were done depicting the Virgin Mary knitting alongside the baby Jesus. 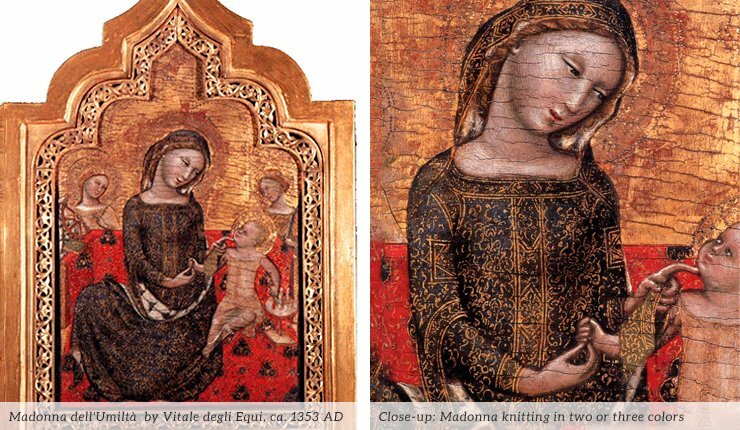 These “knitting Madonnas” tell us that, by the 14th century, knitting had spread into Italy and Germany. The Virgin is shown knitting in the round and doing colorwork, so we know these techniques must also have made their way to the region. 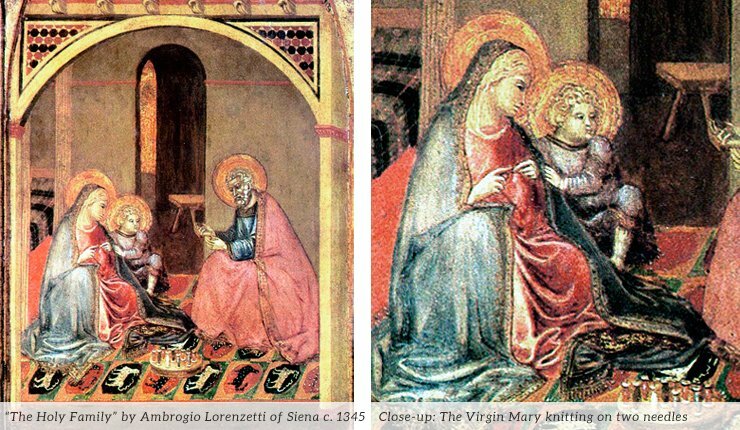 But, now, a pressing question: why is the Virgin Mary knitting? Joan Thirsk writing in The Cambridge History of Western Textiles suggests that knitting was becoming more commonplace and, perhaps, more publicly fashionable among upper-class women. Madonna as patriarchy-defying feminist? Not until the 1990s, I’m afraid. By the end of the 16th century, knitting was an established craft that was driven by a powerful fashion trend: knitted stockings. Did you hear that? A disaster. Stockings were as fundamental to a Renaissance man’s wardrobe as blue jeans to the modern Joe. The more elegant the stocking, the more fashionable the man. In response to this demand for knits, knitting guilds sprang up, beginning in the 1400s. Exclusivley male, they were established to protect trade secrets, improve the quality of the profession, and drum up business. Think of them like a labour union – a competitve, rigorous, masterfully skilled labour union, that is. So You Think You Can Knit? If you were a young man in the Middle Ages and you wanted to become a Master Knitter in a knitting guild, you’d need to devote six years of your life to training. Three years would be spent in apprenticeship learning from the masters; another three were spent travelling the world to learn foreign techniques and patterns. If you’re as obsessed with knitting as me, this probably sounds like the best time ever. Barring dysentry and the bubonic plague, what could be better than spending six years knitting and traipsing all over Europe? As dreamy as it sounds, joining a guild was no cakewalk. After returning home from travel, a knitting apprentice would prove his mastery through a rigorous exam. To gain full membership to the Hand-Knitters’ Guild of Strasbourg, knitters had to knit a wallhanging patterned with flowers, like this one. Adam and Eve appear beneath a central panel depicting Jacob’s Dream. France, 1781. Victoria & Albert Museum. Detail of Adam and Even from a knitted wallhanging. France, 1781. Victoria & Albert Museum. Required garments included a felted cap, a pair of stockings or embroidered gloves, a shirt or waistcoat and the pièce de résistance – a knitted carpet! Akin to a grad thesis, this carpet or wall-hanging was the culmination of your six years of learning, a representation of your mastery, artistry, and good taste. No pressure! Intense as the vetting process was, the guild’s high standards elevated knitting to an art. Certain guilds became well-known for their work. 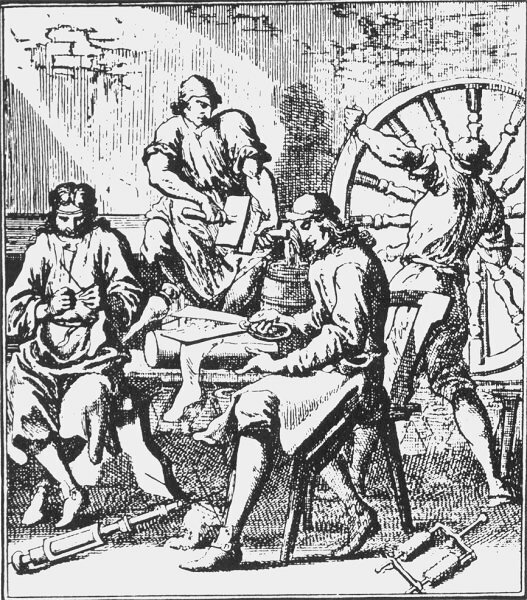 In the early 16th century, Parisian guilds were considered the very best. Even in the Middle Ages Parisians were trumping everyone in style! Just as we moderns have our favourite designers and fashion houses, every member of the nobility had his or her favourite Master Knitter. 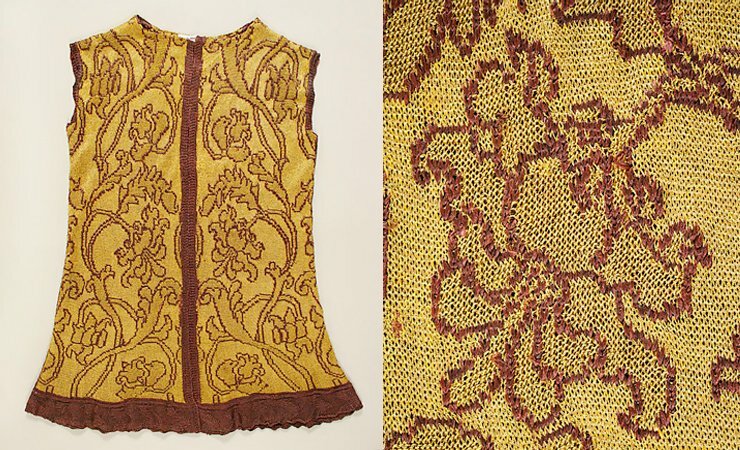 The period of the knitting guilds produced some of the most astonishingly beautiful knitted items. How pretty is this Italian jacket? Made of silk and metallic thread. Italy, 16th century. Metropolitan Museum of Art. From the 1400s, knitting grew as a trade. It spread into new lands along with European explorers and colonists during the Age of Exploration. 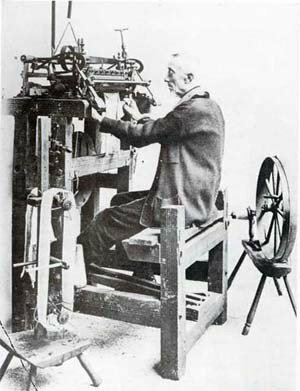 Then in 1589, Englishman William Lee invented the knitting machine. While it didn’t demolish the handknitting industry, it foreshadowed more technological changes to come. Namely, the Industrial Revolution. During the Industrial Revolution, knitting machines became more sophisticated and the manufacture of knits shifted from human hands to machines. In a few generations, knitting transformed from a serious trade (remember those knitting guilds?) to a sweet, staid parlour craft for Victorian ladies. You’d think this would be the end of knitting. With machines to do all the work and knitting looking as vital as a limp noodle, why bother with it at all? It would surely go the way of the Dodo. And yet – knitting lives on. It found its patriotic calling during the two World Wars. It provided employment for the poor in the twentieth century as it did during the Renaissance. In the late 1920s, it was revived as an art form in the world of fashion (thanks in large part to Elsa Schiaparelli), and continues to be part of the fashion firmament today. Elsa Schiaparelli’s iconic Trompe L’oeil “Bow Knot” sweaters jumpstarted her career and reinvigorated knitwear in the late 20s. Now we are in the twenty-first century, the “Information Age.” We live in a time of efficiency, of endless screens, of fractured attention spans and workaholism. Knitting feels anachronistic here, like we took a time machine and our hands came back stuck in the past, holding these weird sticks and string. So, why are we still knitting? Why does it matter? The reason I think knitting has persisted for so long is because it is beautiful. Plain and simple. It’s beautiful to do and beautiful to behold. Knitting satisfies a deep desire in us to create beautiful things, and it allows us the satisfaction of being a creator. Buying a sweater just won’t give you the same intense pleasure and pride as knitting one with your own hands. That’s why I think knitting will outlast us all. As long as we humans retain the part of ourselves that yearns to create and innovate, the part that delights in beauty, then knitting will live on – from that first mysterious knitter to the four corners of the world and beyond. I just read the history of knitting, parts one and two, while sipping my morning coffee. Thanks for the enlightenment! What a great blog post and now I am inspired to continue learning the craft of knitting. Your website is beautiful and I’ll look forward to more great posts. Thanks Doreen! The more I researched knitting’s history the more it boggled my mind. It’s so weird! And colourful! I’m planning on doing a few more in-depth history posts on knitting during the American Civil War and the two World Wars, and even knitting during the Victorian era! They’re so briefly skimmed here and the history is ripe with good stuff! Thank you so much for such an informative read – currently in my 2nd yr of uni and needed information for my essay – you have been the only site to provide me with exactly what I needed! Thank you. As a keen knitter myself I was curious to examine how it is now seen as a female ‘hobby’ and yet for men it was always a craft. Great site. Thanks Terrie! So’m so glad this post helped you out. I was totally blown away when I found out that knitting was originally a craft for men. And now it’s seen as a lady’s only craft! I really enjoyed this! Thanks for writing it. I laughed out loud and learned a lot! Cool! So glad you enjoyed it, Lucie! Thank you for an awesome article! 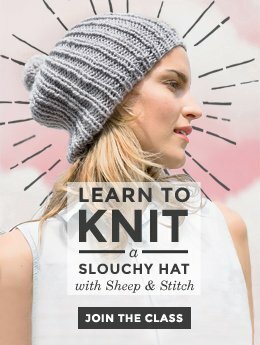 I love knitting and have always been curious about it. Parts 1 and 2 (and the pictures) were totally fascinating and incredible, and I’d definitely like to read more. Any chance you’ll turn them into a book? Thanks again! Thanks for your nice comment, Rose! No plans on writing a book. There are quite a few good ones out there. In fact, I scoured them from cover to cover to write these two blog posts! If you really want to geek out on knitting history, check out: A History of Hand Knitting by Richard Rutt (http://amzn.com/0934026351), Knitting America: A Glorious Heritage from Warm Socks to High Art (http://amzn.com/0760340110) and Knitting Around the World (http://amzn.com/0760337942) I’m sure there are others, but these three were really great! This is fascinating stuff! I’m the editor of a public scholarship blog focusing on women in the early modern period, particularly 1640-1830. Would you consider a post on this period, and maybe allow us to feature it on our site? We’d love to promote your work! Sure! You’re welcome to post about this blog post and include any excerpts and images. I only ask that you provide a link back to this blog post. Thanks! What a fantastic article. I am a computer teacher and knitting is one of my hobbies. I love it. You kept me all the time reading. I didn’t want to stop. Well done! I am going to show my learners, this is how you do research the correct way. Enjoy want you are doing. I have been knitting since the 5th grade (I was 10 or 11 when I watched and learned from my mother), it has been 48 years and I still enjoy this hobby of mine. It’s a true lifetime hobby, isn’t it? And I love how it’s passed down from generation to generation. Thank you for such an interesting read! I really enjoyed the history and amazingly intricate pieces. I am doing research to teach a class for persons 50 and older about the history of knitting. I will be using your website as a source and it will be sited. Great research and a fantastic presentation without sounding to “bookish”. Hello Davina, I enjoyed reading your article. Thank you for sharing your knowledge of knitting. Your example of what an apprentice had to go through to be a member of the Hand Knitter’s Guild. That it was specifically for hand knitting, made me think that there were other types of knitting and guilds during that period. You showed that the inventor of a mechanical knitting machine used a rake. From where did he get that idea? Hey Bernadette! I definitely remember reading about looms! If I remember correctly, “A History of Hand Knitting” by Richard Rutt covers this. I’m not sure where the idea of a rake came from. I was mostly interested in hand knitting, although mechanical knitting is another fascinating topic! 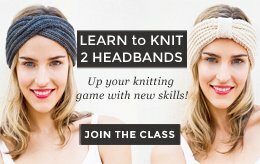 I ADORE this crash course in the history of knitting! You’ve done all the homework so the rest of us don’t have to, and even wrote it up beautifully so that it was a joy to read! Thank you so much! 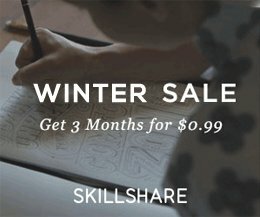 I’m a Production Assistant working on a historical documentary on knitting. Would you be able to tell me where you got those images you posted of the Madonnas knitting and the engraving of the process to knitting a stocking underneath them? Do you know who the original creator/owner of the images is? Do you know whether or not they died? If so, when? I’m wondering if you know whether they are considered public domain or not? If they are, do you know where I could find verification of this? The knitting madonnas include the artist’s name on each image. It’s written directly on the image including the estimated date of its painting. Since these were painted centuries ago, it’s safe to assume that the artists have long passed away. I don’t think they are all public domain, however. If you do a google image search, you should be able to track down the exact location where the paintings are housed. (This means going to images.google.com and uploading the image you are searching for. This will bring up every instance where the image in question is found online). I can tell you that the first madonna painting is on the wikipedia article for the history of knitting, and it’s cited as public domain: https://en.wikipedia.org/wiki/History_of_knitting Happy researching! Love your writing, information and thoughts! I love the idea of a class of middle schoolers busily knitting away! What a great picture. Happy new year! I am doing a presentation on double knitting by hand and wondered if there is a relationship between woven double weave and double knitting. 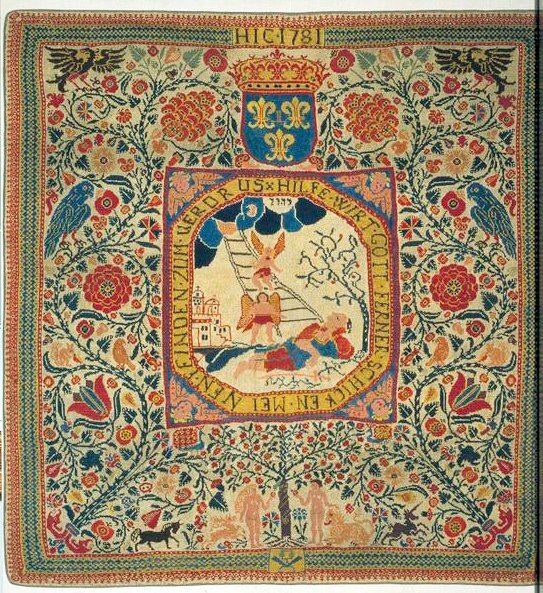 In the research I have done to date I note that the Scandinavian Countries (Finland especially) are famous for their double weave cloth and/or designs. Thank you for an interesting article on nailbinding and it’s prerequisite of knitting. Get updates on new patterns, videos and other fun goodies! Sign up for new patterns, sales and exclusive giveaways. 100% good stuff!